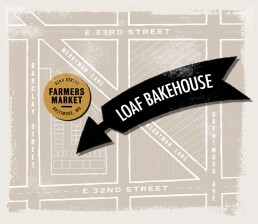 Loaf Bakehouse is a micro-bakery focused on creating naturally leavened goods that utilize locally grown, organic grains. All of our goods are baked out of a commissary facility in Baltimore and sold at local markets in the surrounding area. Interested in weekly bread? We offer prepaid monthly bread subscriptions at pick-up locations throughout the city. Rain or shine, all year long. The market is located at the intersection of E 32nd St. and Barclay St. in Baltimore, MD. Questions? Special order requests? We'd love to hear from you.